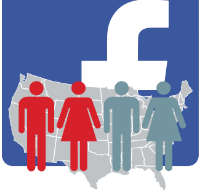 With that important caveat lurking in the back of our minds, we have carefully captured and analyzed Facebook metrics from the pages of candidates running for U.S. Senate since September 2013. We have taken this data and added it into a simple model, what we call the Facebook Forecasting Model, to arrive at predictions of the percent – in a two-way race – each candidate will earn on Election Day in November. Now, with most of the primaries behind us (except New Hampshire! ), we are publishing a weekly update of our forecast here at hashtagdemocracy. Commentary on the forecast will be added when appropriate. The forecast is presented as two-week and three-week, rolling averages of the model’s predictions. From 2012, we found that averaging the predictions over these time periods produced forecasts with a higher R-Square. In early August, we began with eight Senate races. Since then, we have added four more contests so that the model now predicts outcomes of every Senate race considered a tossup by leading forecasts (see the New York Times 8/31) with the exception of the jungle primary in Louisiana. We will add forecasts for Montana, South Dakota, and New Hampshire in the coming weeks. Other Senate campaigns are not competitive, easy to predict, and will not be included in the forecast. How accurate will our forecasts be? Only time will tell. We have confidence in the model and in our ability to track Facebook metrics accurately. But the real proof will be “in the pudding” that comes out of the blast chiller on the night of November 4th.